Allow me to introduce Myself: I'm an Elephant! What I Like to Eat: We are a greedy bunch consuming about 400 pounds of food and 50 gallons of water a day. Our palates delight in bananas, leaves, bamboo, grass, bark and sugarcanes. Betcha Didn't Know This About Me: Our brain alone weighs 10 pounds, and we are renowned for our long memories that span many many years. Group Therapy: Elephants are a very tight familial bunch roaming in groups of females who are related to one another. Herds can be as small as 10 in a group or as large as 100, and are led by the largest female in the group. She makes all of the decisions for everyone: when to eat, where to move, where to sleep, etc. It takes a village to raise one calf (when born can weigh 200 pounds). The entire herd nurtures and protects the calf. Boy calves leave the herd about the age of 12 and live on their own or with other males. Movie Stars: Grab your popcorn and large diet coke and be prepared to be entertained. We have evolved from just circus performers. We are stars of the big screen making appearances in numerous blockbuster movies like "The Jungle Book", "Ice Age", "Tarzan", "Horton Hears a Who" and "300" among others. Large and in Charge: The African elephant is the largest mammal on the planet. Period. Feelings: Not only do we have great memories, we have the ability to feel and display our emotions. We get sad, happy and grieve, and love to play just like humans. 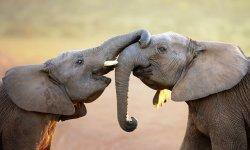 What We Fear: Poaching for the illegal ivory trade and our disappearing habitat.